LLTEK carries a brand new piece of technology (now upgraded with program selectability) designed to put performance in the pedal. 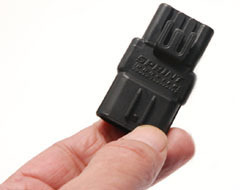 In most newer generation European vehicles, the gas pedal is no longer physically connected with the throttle body by a cable. Instead, your car employs "Drive by Wire" technology, essentially a sensor that measures how much you have depressed the gas pedal. The sensor sends this information to the ECU which in turn signals for the appropriate amount of gas to be delivered to your engine. Sprint Booster will eliminate delay and punch up response. For Example: If two identical Golf V�s - running side-by-side with the same octane (except one Golf V has the Sprint Booster installed) - leave the mark, off the line, when the light turns green... the Golf V with the Sprint Booster installed will get to the � mile faster than the other Golf V ten times out of ten. HOW? 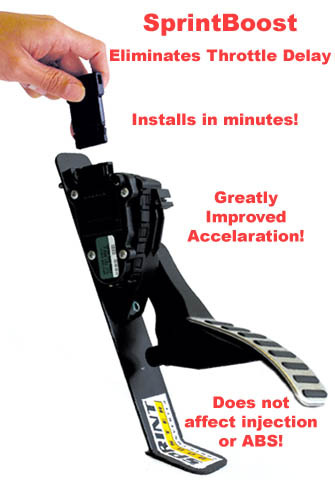 The SprintBooster is a card-sized performance upgrade that installs behind your gas pedal in minutes. It requires no special tools or computer skills. The electronics snap in and snap out with no function overlap. It has one stand-alone purpose and automated sensors in your vehicle will not be affected or interfered with. Its sole purpose is to get the signal of acceleration to the throttle body faster and it does this very well. You will notice a marked improvement in response. With the switch connected, drivers will be able (by pressing the LED button) to choose between 3 acceleration programs (2 driving modes and 1 factory settings) . The default mode is FULL Boost setting signalled with a red LED. This means that once the booster card and switch is installed - FULL Boost mode will be active. By pressing the led button once, FULL boost mode is turned off and the factory setting mode is re-activated (signalled with no LED illuminated). If the button is pressed once more the Semi-Boost Program is activated (signalled with the green LED illuminated). Drivers can roate through the sequence to achieve their preference in driving mode. The instructions that come with every unit strongly recommend that the car is idling when driving modes are changed. 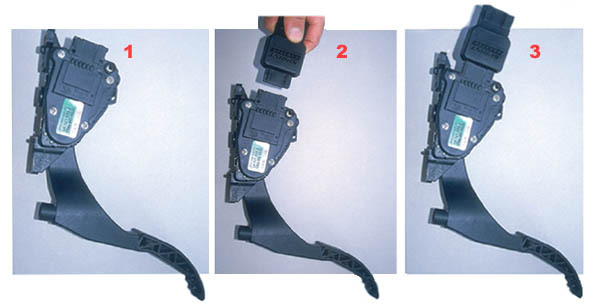 The switch can be installed or removed at any time in which case the pedal will retain the last setting before disconnection. Please note that these units are not interchangeable - each is programmed for a specific make,model and engine. Modern ECUs have a memory function (also referred to as an Adaptive Driving Program) inasmuch as your vehicle becomes accustomed to your driving habits and conditions. The Sprint Booster alerts your ECU that it should always be ready for the gas pedal to be "punched" and that when this happens it will deliver. If you have any questions about this product - please call toll-free in North America at 1 888 465 5835 or International at 001 514 733 6333.